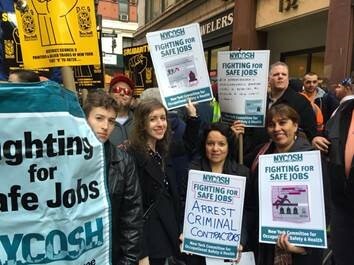 NEW YORK COMMITTEE FOR OCCUPATIONAL SAFETY AND HEALTH INC | CREATING SAFE AND HEALTHY WORKPLACES FOR ALL! CREATING SAFE AND HEALTHY WORKPLACES FOR ALL! Workplaces injuries are often preventable. We can build a movement to create better jobs for all workers. If you purchased a $10 student membership please enter the name of your school below. Did you donate at least $40? Do you want to include your membership dues? If you purchased a $25 special individual membership, please enter your NYCOSH member union below. : Get On Our Mailing List! Donate 100% - Add 3% so that 100% of the donation goes to NEW YORK COMMITTEE FOR OCCUPATIONAL SAFETY AND HEALTH INC.
NEW YORK COMMITTEE FOR OCCUPATIONAL SAFETY AND HEALTH INC has partnered with Network for Good to securely process your online credit card payment via Network for Good (tax ID 68-0480736). This transaction will appear on your credit card statement as "Network for Good." This transaction is subject to Network for Good’s Privacy, Security & Disclosure Statement and the Charitable Solicitation Disclosure.